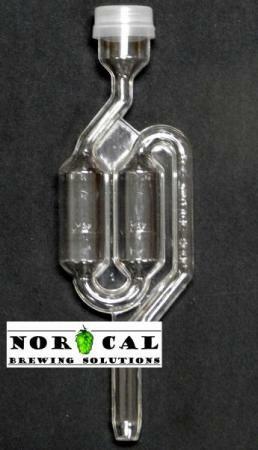 S-shaped plastic airlock, 1-piece plus dust cap. Perfect for slower and/or secondary fermentation. Very popular food grade “double bubble” fermentation airlock manufactured by The Vintage Shop. These are standard clear plastic airlocks that fit standard rubber "gum" stoppers. They properly fit any stopper that has a 3/8" hole drilled in it to accept a standard airlock. They also fit rubber grommets with 3/8" inner diameter opening... Like the ones that come with a whole host of beer and wine fermentation bucket lids. These air locks are one-piece, with a snap-on cap. The cap has tiny little CO2 escape holes drilled into them. These airlocks work great during secondary fermentation - they do a fantastic job of preventing back-flush into the fermentation chamber during ambient temperature changes in the room.